Jomon pottery, Japanese Stone Age. The concept of dividing pre-historical ages into systems based on metals extends far back in European history, probably originated by Lucretius in the first century BC, but the present archaeological system of the three main ages—stone, bronze and iron—originates with the Danish archaeologist Christian Jürgensen Thomsen (1788–1865), who placed the system on a more scientific basis by typological and chronological studies, at first, of tools and other artifacts present in the Museum of Northern Antiquities in Copenhagen (later the National Museum of Denmark). He later used artifacts and the excavation reports published or sent to him by Danish archaeologists who were doing controlled excavations. His position as curator of the museum gave him enough visibility to become highly influential on Danish archaeology. A well-known and well-liked figure, he explained his system in person to visitors at the museum, many of them professional archaeologists. "... then Zeus the father created the third generation of mortals, the age of bronze ... They were terrible and strong, and the ghastly action of Ares was theirs, and violence. ... The weapons of these men were bronze, of bronze their houses, and they worked as bronzesmiths. There was not yet any black iron." "For the nature of the world as a whole is altered by age. Everything must pass through successive phases. Nothing remains forever what it was. Everything is on the move. Everything is transformed by nature and forced into new paths ... The Earth passes through successive phases, so that it can no longer bear what it could, and it can now what it could not before." "The earliest weapons were hands, nails and teeth. Next came stones and branches wrenched from trees, and fire and flame as soon as these were discovered. Then men learnt to use tough iron and copper. With copper they tilled the soil. With copper they whipped up the clashing waves of war, ... Then by slow degrees the iron sword came to the fore; the bronze sickle fell into disrepute; the ploughman began to cleave the earth with iron, ..."
Lucretius envisioned a pre-technological man that was "far tougher than the men of today ... They lived out their lives in the fashion of wild beasts roaming at large." The next stage was the use of huts, fire, clothing, language and the family. City-states, kings and citadels followed them. Lucretius supposes that the initial smelting of metal occurred accidentally in forest fires. The use of copper followed the use of stones and branches and preceded the use of iron. "It was Man's hand that made them serve as instruments (C'est la main des hommes qui les leur a données pour servir d'instrumens...)"
In 1816 Thomsen at age 27 was appointed to succeed the retiring Rasmus Nyerup as Secretary of the Kongelige Commission for Oldsagers Opbevarung ("Royal Commission for the Preservation of Antiquities"), which had been founded in 1807. The post was unsalaried; Thomsen had independent means. At his appointment Bishop Münter said that he was an "amateur with a great range of accomplishments." Between 1816 and 1819 he reorganized the commission's collection of antiquities. In 1819 he opened the first Museum of Northern Antiquities, in Copenhagen, in a former monastery, to house the collections. It later became the National Museum. "nothing is more important than to point out that hitherto we have not paid enough attention to what was found together." "we still do not know enough about most of the antiquities either; ... only future archaeologists may be able to decide, but they will never be able to do so if they do not observe what things are found together and our collections are not brought to a greater degree of perfection." "To put artifacts in their proper context I consider it most important to pay attention to the chronological sequence, and I believe that the old idea of first stone, then copper, and finally iron, appears to be ever more firmly established as far as Scandinavia is concerned." "Perhaps it will be thought ... I have selected ... the passages most unfavorable to savages. ... In reality the very reverse in the case. 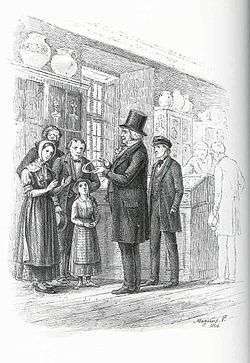 ... Their real condition is even worse and more abject than that which I have endeavoured to depict." Sir John Lubbock's use of the terms Palaeolithic ("Old Stone Age") and Neolithic ("New Stone Age") were immediately popular. They were applied, however, in two different senses: geologic and anthropologic. In 1867-1868 Ernst Haeckel in 20 public lectures in Jena, entitled General Morphology, to be published in 1870, referred to the Archaeolithic, the Palaeolithic, the Mesolithic and the Caenolithic as periods in geologic history. He could only have gotten these terms from Hodder Westropp, who took Palaeolithic from Lubbock, innovated Mesolithic ("Middle Stone Age") and Caenolithic instead of Lubbock's Neolithic. None of these terms appear anywhere, including the writings of Haeckel, before 1865. Haeckel's use was innovative. "Man, in all ages and in all stages of his development, is a tool-making animal." "Their presence is thus not always an evidence of a high antiquity, but of an early and barbarous state; ..."
The Second Stage, "Flint Flakes" are of the "simplest form" and were struck off cores. Westropp differs in this definition from the modern, as Mode 2 contains flakes for scrapers and similar tools. His illustrations, however, show Modes 3 and 4, of the Middle and Upper Palaeolithic. His extensive lithic analysis leaves no doubt. They are, however part of Westropp's Mesolithic. "Sir John Lubbock has proposed to call them the Archaeolithic, or Palaeolithic, and the Neolithic Periods respectively, terms which have met with almost general acceptance, and of which I shall avail myself in the course of this work." 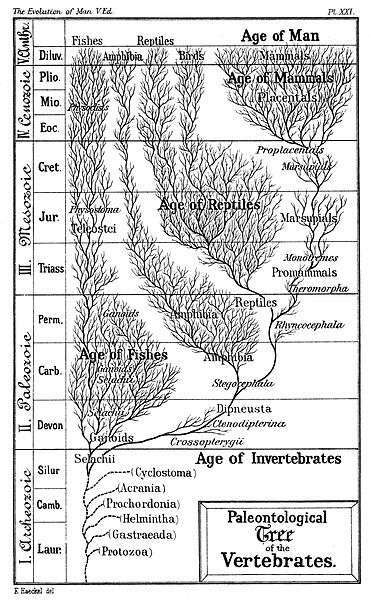 Meanwhile, Haeckel had totally abandoned the geologic uses of the -lithic terms. The concepts of Palaeozoic, Mesozoic and Cenozoic had been innovated in the early 19th century and were gradually becoming coin of the geologic realm. Realizing he was out of step, Haeckel started to transition to the -zoic system as early as 1876 in The history of creation, placing the -zoic form in parentheses next to the -lithic form. "It has been generally assumed that a break occurred between the period during which ... the continent of Europe was inhabited by Palaeolithic Man and his Neolithic successor ... No physical cause, no adequate reasons have ever been assigned for such a hiatus in human existence ...."
"Between the Palaeolithic and Neolithic, there is a wide and deep gap, a large hiatus." "I was fortunate to discover the remains of that unknown time which separated the Magdalenian age from that of polished stone axes ... it was, at Mas-d'Azil in 1887 and 1888 when I made this discovery." "With Epipaleolithic I mean the period during the early days that followed the age of the reindeer, the one that retained Paleolithic customs. This period has two stages in Scandinavia, that of Maglemose and that of Kunda. (Par époque épipaléolithique j'entends la période qui, pendant les premiers temps qui ont suivi l'âge du Renne, conserve les coutumes paléolithiques. Cette période présente deux étapes en Scandinavie, celle de Maglemose et de Kunda.)" "But in my opinion this term is not justified, as it would be if these phases presented a natural evolutionary development – a progressive transformation from Paleolithic to Neolithic. In reality, the final phase of the Capsian, the Tardenoisian, the Azilian and the northern Maglemose industries are the posthumous descendants of the Palaeolithic ..."
"The continuity between geology, prehistoric archaeology and history is so direct that it is impossible to picture early man in this country without using the results of all these three sciences." "In Kent's Cave the implements obtained from the lower stages were of a much ruder description than the various objects detected in the upper cave-earth ... And a very long time must have elapsed between the formation of the lower and upper Palaeolithic beds in that cave." "Both for Bronze and Stone it was now evident that a few hundred years would not suffice. In fact, good grounds existed for dividing each of these periods into two, if not more." Amongst African archaeologists, the terms Old Stone Age, Middle Stone Age and Late Stone Age are preferred. "...an advance in knowledge and civilization which amounted to a revolution in the then existing manners and customs of the world." 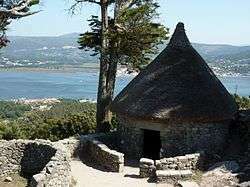 "There are quite a large number of archaeologists who justifiably consider the period of the Late Stone Age to be a neolithic revolution and an economic revolution at the same time. For that is the period when primitive agriculture developed and cattle breeding began." "The assumption that any savage tribe today is primitive, in the sense that its culture faithfully reflects that of much more ancient men is gratuitous." "But when the tools ... are considered ... in their totality, they may reveal much more. They disclose not only the level of technical skill ... but also their economy .... The archaeologists's ages correspond roughly to economic stages. Each new "age" is ushered in by an economic revolution ...."
"Archaeologists can define a period when it was apparently the sole economy, the sole organization of production ruling anywhere on the earth's surface." "The Bronze Age of Britain may, therefore, be regarded as an aggregate of three stages: the first, that characterized by the flat or slightly flanged celts, and the knife-daggers ... the second, that characterized by the more heavy dagger-blades and the flanged celts and tanged spear-heads or daggers, ... and the third, by palstaves and socketed celts and the many forms of tools and weapons, ... It is in this third stage that the bronze sword and the true socketed spear-head first make their advent." "In thus speaking of a bronze-using period I by no means wish to exclude the possible use of copper unalloyed with tin." "A period of transition from the age of stone to that of bronze (periodo di transizione dall'età della pietra a quella del bronzo)"
The advent of the Iron Age is marked by the initial use of iron in any region, whether brought in from elsewhere, or by evolution of the smelting process in that region. 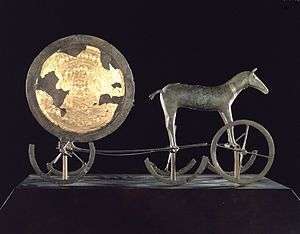 As ancient writers considered that they were in the Iron Age, they did not define an end to it. This convention prevailed in modern archaeology as well. Iron is still the major hard material in use in modern civilization, and steel is a vital and indispensable modern industry. Stone age Palaeolithic Handmade tools and objects found in nature – cudgel, club, sharpened stone, chopper, handaxe, scraper, spear, harpoon, needle, scratch awl. 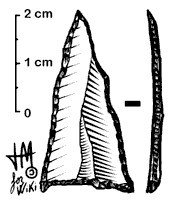 In general stone tools of Modes I—IV. Hunting and gathering Mobile lifestyle – caves, huts, tooth or skin hovels, mostly by rivers and lakes A band of edible-plant gatherers and hunters (25–100 people) Evidence for belief in the afterlife first appears in the Upper Palaeolithic, marked by the appearance of burial rituals and ancestor worship. Shamans, priests and sanctuary servants appear in the prehistory. "Last century Herbert Spencer, Lewis H. Morgan and Tylor propounded divergent schemes ... they arranged these in a logical order .... They assumed that the logical order was a temporal one.... The competing systems of Morgan and Tylor remained equally unverified—and incompatible—theories." "So many archaeological writers have used this model for so long that for many readers it has taken on a reality of its own. In spite of the theoretical agonizing of the last half-century, epochalism is still alive and well ... Even in parts of the world where the model is still in common use, it needs to be accepted that, for example, there never was actually such a thing as 'the Bronze Age.'" "But as a more rigorous sociological approach has begun to show that changes at the economic, political and ideological levels are not 'all of apiece' we have come to realise that time may be segmented in as many ways as convenient to the researcher concerned." "As radiocarbon and other forms of absolute dating contributed more detailed and more reliable chronologies, the epochal model ceased to be necessary." "Although modern archaeologists realize that this tripartite division of prehistoric society is far too simple to reflect the complexity of change and continuity, terms like ‘Bronze Age’ are still used as a very general way of focusing attention on particular times and places and thus facilitating archaeological discussion." "... attempts by Eurocentric archaeologists to apply the model to African archaeology have produced little more than confusion, whereas in the Americas or Australasia it has been irrelevant, ..."
"... Professor Wilson's presentation of prehistoric archaeology was a European product carried across the Atlantic to promote an American science compatible with its European model." She goes on to complain of Wilson that "he accepted and reprised the idea that the European course of development was paradigmatic for humankind." This criticism argues that the different societies of the world underwent social and technological developments in different ways. A sequence of events that describes the developments of one civilization may not necessarily apply to another, in this view. Instead social and technological developments must be described within the context of the society being studied. ↑ Lines 140-155, translator Richmond Lattimore. ↑ Beye, Charles Rowan (Jan 1963). 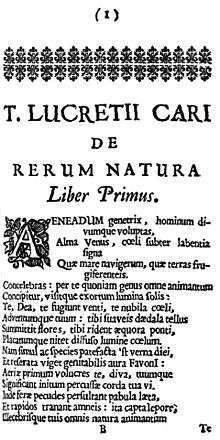 "Lucretius and Progress". The Classical Journal. 58 (4): 160–169. ↑ De Rerum Natura, Book V, about Line 800 ff. The translator is Ronald Latham. ↑ De Rerum Natura, Book V around Line 940 ff. ↑ Goodrum 2008, p. 496. ↑ Hamy 1906, p. 259: "c'est a Michel Mercatus, Médecin de Clément VIII, que la première idée est duë..."
↑ Thomsen, Christian Jürgensen (1836). "Kortfattet udsigt over midesmaeker og oldsager fra Nordens oldtid". In Rafn, C.C. Ledetraad til Nordisk Oldkyndighed (in Danish). Copenhagen: Kongelige Nordiske Oldskriftselskab . ↑ This was not the museum guidebook, which was written by Julius Sorterup, an assistant of Thomsen, and published in 1846. Note that translations of Danish organizations and publications tend to vary somewhat. ↑ "Reviews". The Medical Times and Gazette: A Journal of Medical Science, Literature, Criticism and News. London: John Churchill and Sons. II. Aug 6, 1870. ↑ Taylor, Isaac (1889). The Origin of the Aryans. An Account of the Prehistoric Ethnology and Civilisation of Europe. New York: C. Scribner's sones. p. 60. 1 2 Haeckel, Ernst Heinrich Philipp August; Lankester, Edwin Ray (1876). The history of creation, or, The development of the earth and its inhabitants by the action of natural causes : a popular exposition of the doctrine of evolution in general, and of that of Darwin, Goethe, and Lamarck in particular. New York: D. Appleton. p. 15. 1 2 Piette 1895, p. 236: "Entre le paléolithique et le neolithique, il y a une large et profonde lacune, un grand hiatus; ..."
↑ Piette 1895, p. 239: "J'ai eu la bonne fortune découvrir les restes de cette époque ignorée qui sépara l'àge magdalénien de celui des haches en pierre polie ... ce fut, au Mas-d'Azil, en 1887 et en 1888 que je fis cette découverte." ↑ Brown 1893, pp. 74–75. ↑ Stjerna 1910, p. 12: "... a persisté pendant la période paléolithique récente et même pendant la période protonéolithique." ↑ Obermaier, Hugo (1924). Fossil man in Spain. New Haven: Yale University Press. p. 322. ↑ Geikie, James (1881). Prehistoric Europe: A Geological Sketch. London: Edward Stanford. .
↑ Sollas, William Johnson (1911). Ancient hunters: and their modern representatives. London: Macmillan and Co. p. 130. ↑ "On an Earlier and Later Period in the Stone Age". The Gentleman's Magazine: 548. May 1862. ↑ Wallace, Alfred Russel (1864). "The Origin of Human Races and the Antiquity of Man Deduced From the Theory of "Natural Selection"". Journal of the Anthropological Society of London. 2. ↑ Howarth, H.H. (1875). "Report on the Stockholm Meeting of the International Congress of Anthropology and Prehistoric Archaeology". Journal of the Royal Anthropological Institute of Great Britain and Ireland. IV: 347. ↑ Chambers, William and Robert (December 20, 1879). "Pre-historic Records". Chambers's Journal. 56 (834): 805–808. ↑ Childe, who was writing for the masses, did not make use of critical apparatus and offered no attributions in his texts. This practice led to the erroneous attribution of the entire three-age system to him. Very little of it originated with him. His synthesis and expansion of its detail is however attributable to his presentations. ↑ Dawkins, W. Boyd (July 1866). "On the Habits and Conditions of the Two earliest known Races of Men". Quarterly Journal of Science. 3: 344. ↑ "Kenyon Institute". Retrieved 31 May 2011. ↑ Howorth, H.H. (1875). "Report of the Stockholm Meeting of the International Congress of Anthropology and Prehistoric Archaeology". Journal of the Anthropological Institute of Great Britain and Ireland. London: AIGBI. IV: 354–355. ↑ Pigorini, Luigi; Strobel, Pellegrino (1886). Gaetano Chierici e la paletnologia italiana (in Italian). Parma: Luigi Battei. p. 84. ↑ Childe, V. Gordon; Patterson, Thomas Carl; Orser, Charles E. (2004). Foundations of social archaeology: selected writings of V. Gordon Childe. Walnut Creek, California: AltaMira Press. p. 173. ↑ A predecessor of Lubbock working from the original Danish conception of the three ages. Rowley-Conwy, Peter (2006). "The Concept of Prehistory and the Invention of the Terms 'Prehistoric' and 'Prehistorian': the Scandinavian Origin, 1833—1850". European Journal of Archaeology. 9 (1): 103–130. doi:10.1177/1461957107077709.